Intel launched a trio of Haswell-E (HSW-E) processors in August 2014. Presented in six- and eight-core flavours, the trio are the best consumer chips on the market, supplanting the Ivy Bridge-E processors released two years' ago. Any enthusiast interested in performance should be looking to invest in the HSW-E platform. HSW-E chips use the revised LGA 2011-v3 socket for housing processors on the supporting X99 chipset-based motherboard. The same size as its X79 (LGA 2011) predecessor, meaning older cooling can be carried over, the new socket is notched differently to stop users from inadvertently placing the wrong CPU in the socket. Motherboard manufacturers tend to differentiate their boards via add-in feature such as additional SATA connectivity, improved audio, and such like. But industry giant ASUS is going a step further with X99. Unlike every other manufacturer of X99 boards, ASUS is using a custom LGA2011-v3 socket implementation known as 'OC Socket.' Custom, in this sense, means different from the norm. Intel historically supplies motherboard manufacturers with detailed architecture/engineering guides that help when designing boards. These guides offer motherboard companies insight for fine-tuning their boards for the best possible performance. But recent moves from CPU manufacturers into using what are known as fully-integrated voltage regulators (FIVR) means that motherboard companies cannot access the array of CPU-centric tweaking options that existed previously, hampering these fine-tuning efforts. Nowhere is this Intel-imposed curtailment more evident than on the X99 chipset, where motherboard partners are left in the dark. Intel, for example, simply prescribes a range of voltages and adjustments that can be made in the BIOS; motherboard designers follow suit. ASUS, however, believes the enthusiast should have unfettered access to key voltage rails that can enhance performance. ASUS' engineers have examined the LGA 2011-v3 CPUs in excruciating detail and deduced the role played by each of the pins on the bottom; the new chips, though designated with the same 2011 pin array, actually have different pin-outs than their predecessors. These new processors have more than 2011 contact pads, and ASUS, once the system is overclocked, taps into these additional number to deliver more CPU and memory performance than its competitors. ASUS' OC Socket therefore has more pins than a standard LGA2011-v3 seen on all competitor boards. The extra pin-outs, located at six sections around the socket, enable all ASUS X99 boards to circumvent the voltage limits imposed by Intel and provides a means by which more voltage rails can be monitored/regulated. What's more, the company says, enhanced monitoring and regulation helps when really pushing the CPU to the limit (think 1.6V-plus on the core), minimising voltage drops and increasing overall efficiency by only allocating the exact voltage required. Intel's integrated voltages, accessed by other boards, aren't that fine-tuned, according to engineers. These extra pin-outs also control access to behind-the-scenes voltage and regulation of DDR4 memory. 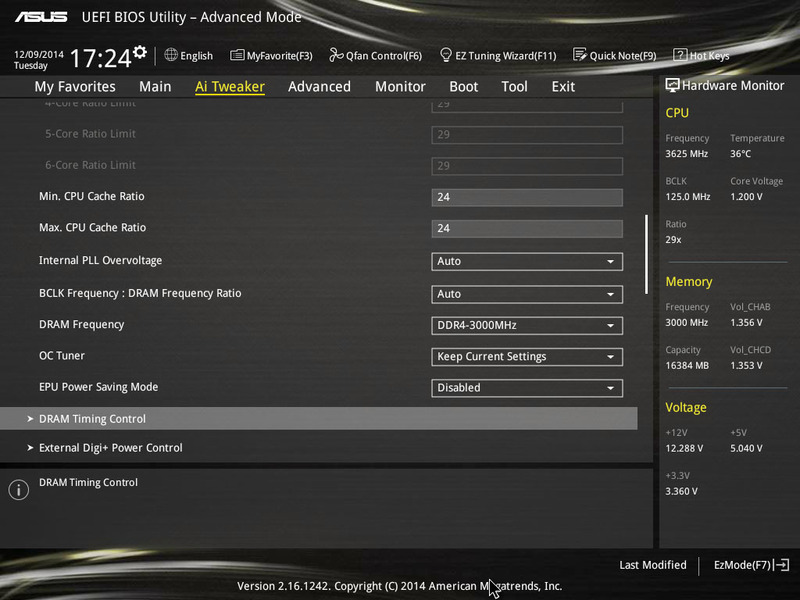 ASUS goes further and says that its OC Socket also enables X99 boards' BIOS to reduce memory voltage yet still increase DDR4 overclocking potential to levels higher than would otherwise be the case. 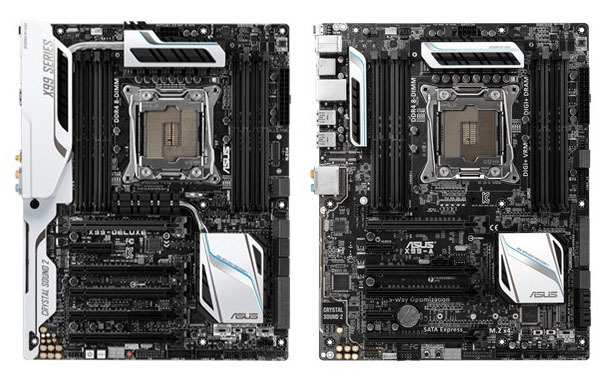 In a nutshell, the ASUS OC Socket, present on all of its X99 motherboards, is physically different than the standard socket. The differences enable ASUS to tease out the maximum performance from the trio of HSW-E processors on the market, particularly when overclocked to the absolute limit. Does OC Socket really work? The theory surrounding the ASUS OC Socket is sound; it offers potentially higher performance through better voltage control made possible by tapping into the extra pins on the HSW-E processors that only become active once the system is overclocked. These claims can be tested empirically by examining the performance of ASUS X99 boards against their peers. Turning to DDR4 memory first, the Intel X99 platform is officially validated to run quad-channel memory at 2,133MHz. Faster memory exists in abundance, right up to DDR4-3,200MHz, but achieving 3,000MHz-plus speeds is certainly not straightforward. 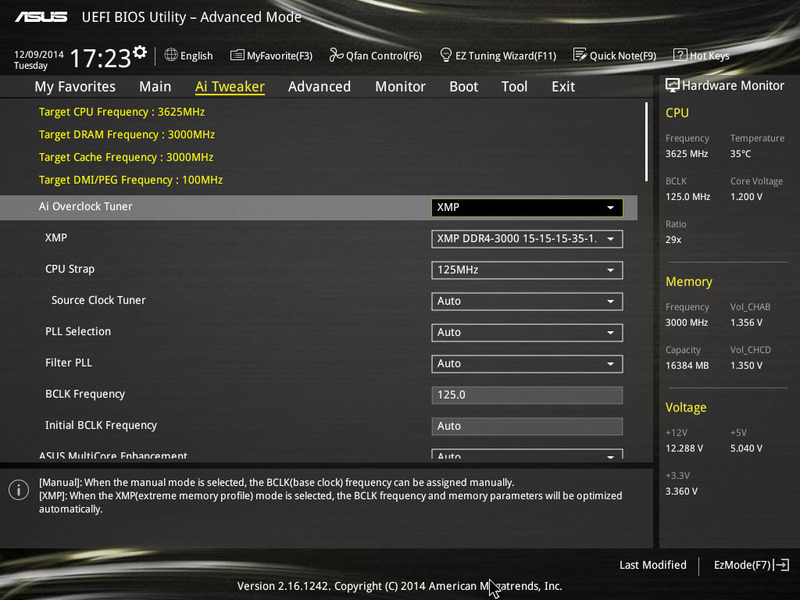 We used a quad-channel pack of G.Skill Ripjaws 4 3,000MHz CL15 memory and installed it on an ASUS X99-DELUXE motherboard, updated to the latest 1103 BIOS. 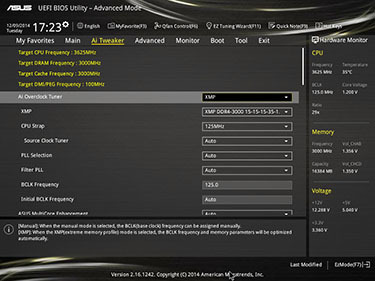 Setting a memory speed of 3,000MHz is incredibly easy on the ASUS; the AI Overclocking Tuner is set to XMP, the motherboard reads the XMP settings from the modules and sets all other parameters accordingly, including CPU Strap frequency and memory voltage, leaving the user to reboot and to enjoy super-fast DDR4. 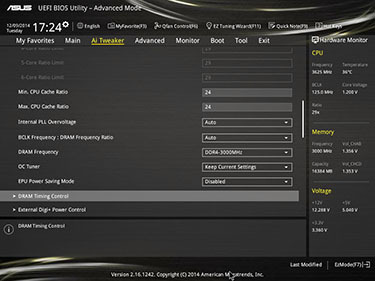 Current settings are shown on the right-hand side of the ASUS BIOS, indicating that 3,000MHz has been successfully achieved with the minimum of fuss. 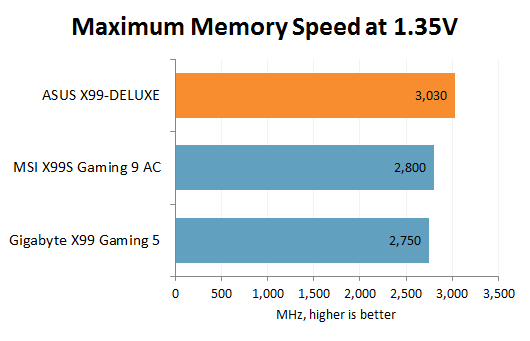 It is fundamentally telling that motherboards not equipped with the OC Socket - all non-ASUS models - struggle to replicate the 3,000MHz speed achieved on the X99-DELUXE. Indeed, comparison Gigabyte and MSI motherboards cannot reach the required 3,000MHz frequency irrespective of how much tweaking is undertaken in the BIOS. The ASUS board sets the 3,000MHz memory frequency in a very straightforward, efficient manner, and it is unmatched in terms of overall potential. Appreciating that the Core i7-5960X CPU and G.Skill memory are identical for the three boards, ASUS' gains can, we surmise, be legitimately attributed to the performance benefits of the company-specific OC Socket. Putting these gains into context against a board running with reference memory speeds of 2,133MHz, ASUS boards, when overclocked, can achieve significantly higher performance without compromising reliability. These memory-related gains impact all facets of high-performance computing. 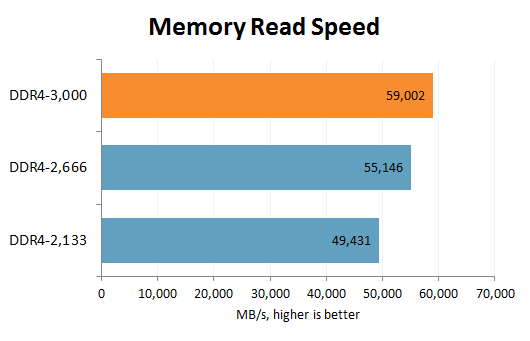 Indeed, using different speed-grades of memory have an enormous impact on the available read speed, as demonstrated by the graph above. Faster memory plays a pivotal role in extracting the maximum performance from a system. ASUS is also keen to point out that OC Socket really comes into its own when the motherboards are pushed to the limit - for example, with the CPU forced to run at 1.6V-plus. Yet the benefits of OC Socket are readily defined at lower voltages normally associated with premium air cooling. 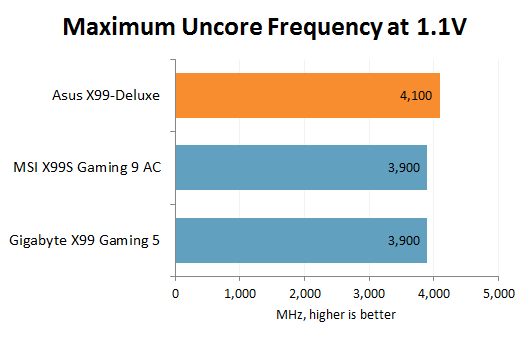 In our tests the ASUS X99-DELUXE is able to overclock the Core i7-5960X higher than on two comparison boards. The OC Socket, in this instance, provides smoother voltage to the processor, resulting in better stability at the cutting edge of performance. So what do these higher frequencies mean to you, the enthusiast? 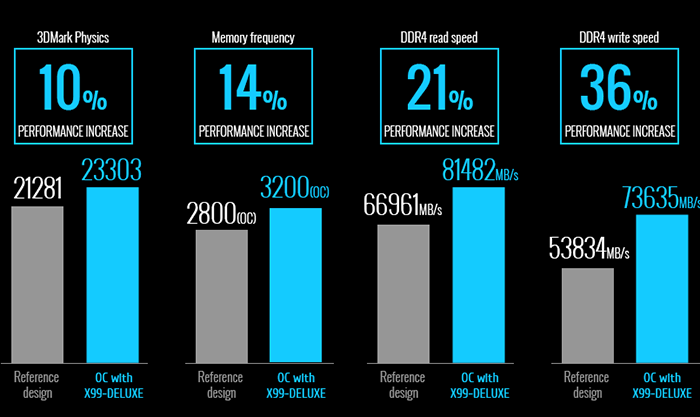 The HSW-E and X99 platform is designed for performance above all else. Any extra performance is more appreciated than on, say, a mid-range Intel or AMD platform. 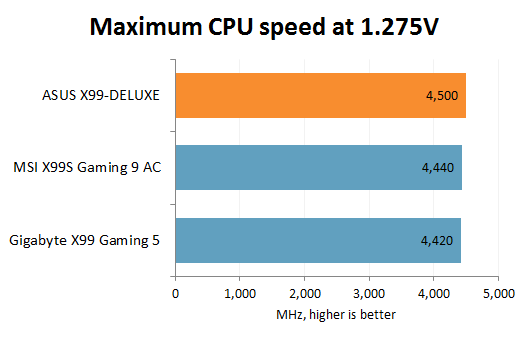 Our tests show that, on average, the ASUS X99-DELUXE, pushed to the absolute limit, outperforms competitor boards by two to three per cent. This may not sound like much in the larger scheme, but when the very best processors and memory are already at the limit, the OC Socket advantage is what separates ASUS from other motherboard vendors. Whether the performance gains are singularly attributable to the OC Socket is something we can never know for sure until ASUS publicly confirms it, but extreme modification for other boards, replicating the benefits of the ASUS technology, have shown that accessing additional pins on the LGA 2011-v3 processors, much like the OC Socket, can pay handsome performance dividends. ASUS has stolen a march on its X99 chipset-based motherboard competitors by using a patent-pending OC Socket that offers extra performance once the platform is overclocked by a healthy degree. Excellent design, a strong BIOS and keen street pricing work in tandem with OC Socket to deliver some of the finest X99 motherboards on the market. Want to invest in the best consumer PC platform around? The range of ASUS boards, imbued with OC Socket technology, is a very good place to start. Readers want to learn more about how and why ASUS has implemented the OC Socket are advised to click on this page that provides insight from Albert Chang, Division Director for ASUS Motherboard and Desktop R+D Division. For full disclosure, this editorial was sponsored by ASUS. A full range of ASUS X99 motherboards are available from Scan Computers, Dabs.com, Overclockers.co.uk, and Ebuyer.com.